Recently the International Federation of Sports Chiropractic interviewed Dr Mark Scappaticci, the FIT INSTITUTE founder about his career as a leading sports chiropractor. Dr Scap talks about his specialized approach to treating high profile athletes and active individuals in the interview below. 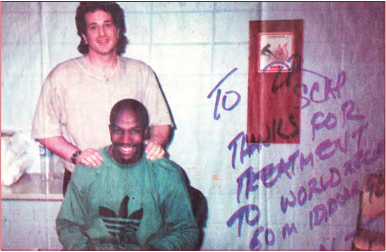 Dr Mark Scappaticci (Canadian Memorial Chiropractic College, 1992) of Niagara Falls, Ontario, Canada first came to prominence as a sports chiropractor when he helped prepare Canadian sprinter Donovan Bailey for the 1996 Atlanta Olympics where Bailey won gold in the 100 meters in world record time. Dr Scappaticci, or Dr Scap as he is known by his patients, was soon treating many track and field athletes from Canada, Jamaica and the USA (e.g. Jamaican hurdler Michelle Freeman, US heptathlete Jackie Joyner-Kersee) and soon NHL, NFL and MLB stars. For five years he was team chiropractor for the Toronto Maple Leafs in the National Hockey League. For the past thirteen years he has been team chiropractor for baseball’s Toronto Blue Jays. FICS News caught up with him over lunch in Toronto recently. At high school were you an athlete yourself? Nothing special. I wrestled and played football but suffered three pneumothoraxes, then a fourth spontaneous lung collapse as I studied for my BSc in Biotechnology at McMaster University. That ended any serious competitive sport. My plan had been to study dentistry. However, a university friend was going into chiropractic, I tried chiropractic treatment, and then called and visited several chiropractors to learn more. They were all welcoming. They and their patients were all very positive and I liked this and the focus on natural health and nutrition. By the time I graduated from CMCC in 1992 my passion was optimizing performance – fine tuning the body, the biomechanics of the musculoskeletal system, for peak performance. An early mentor was a successful Ontario chiropractor Dr Dennis Colonello. Although he obviously listened to their stories he didn’t rely upon what patients said was wrong. I watched him feel the restrictions, read the body, and then tell patients exactly what was wrong and fix it. Did you continue with postgraduate study? Extensively – and this has been the key to my success. Upon graduation I enrolled in the Canadian 3-year part-time sports chiropractic fellowship. During this time I also gained qualifications in acupuncture and the newly launched active release therapy (ART) for which I later became a lead instructor. Integration of these approaches provides a great combination and gave me the ability to work on the three foundations for optimal biomechanical performance – removal of joint and soft tissue restrictions and improved control by the nervous system. There is much more to the approach I have now trademarked as Functional Integrated Therapy or FIT. I use fascial tools and taping. There is the important role of healthy nutrition and appropriate rest. But acupuncture, ART and chiropractic have been the core of FIT and my approach. How did you get to treat Donovan Bailey? In winter 1995 he was to run at an indoor 60 meters event at the Hamilton Spectator Games. His chiropractor Dr Mark Lindsay could not be there because he was with the Canadian Ski Team so I was asked to see and treat Donovan at the meet including through the heats and before the final which I did– as a tune up for optimal function. He went out and won in a personal best time. As a result, his agent Mark Bloch of Flynn Sports Management asked me to go to a meet in Montreal where Donovan was running against the Canadian champion Bruny Surin who had never been beaten over 60 meters before. Donovan won and I was asked to go to Texas to work with him and others in the Flynn stable of athletes during the pre-Olympic preparation. At the Atlanta Games I was working 8 am to 11 pm days seeing nothing of the events, I was so busy. That did not matter. The highlights were Donovan’s gold, gold for the 4 x 100 ms Canadian men – all of them were patients – and the party that followed. Presumably you were managing injuries as well as providing tune ups. Yes. My focus had been improving function and performance through understanding the repetitive strains and biomechanics of the individual sport, finding the specific restrictions that were limiting the athlete, and then removing these. But we found that this approach also gave much quicker recovery from injury. For example, after the 1996 Olympics, US heptathlete and long jumper and six-time Olympic medalist Jackie Joyner-Kersee had a hamstring injury that was preventing her from hurdling and training. They flew me to St Louis to see her and after three sessions she was hurdling again. She thanked me for that by name on the David Letterman show. As another example, at the 2004 Athens Olympics the Ukrainian women’s 100 meters hurdler Olena Krasovska couldn’t train four days before the heats because of the hamstring injury. I was asked to treat her over the four days and she not only recovered rapidly but was able to compete and win the silver medal. You have worked with many prominent hockey players returning from injury most notably Gary Roberts after his surgery and forced retirement. How did that begin? Through Jackie Joyner-Kersee’s personal physician Rick Lehman, who was also orthopaedic surgeon for the St Louis Blues hockey team. He watched as I treated Jackie then asked if I would work with one of the Blues players with back pain preventing him from playing. Success here was part of our discovery in 1996 that my integrated functional approach, later named FIT, was as important for quick recovery as optimizing performance. It also allowed earlier re- turn to full strength training. You have received much national publicity in Canada from 1997 because of your work with Gary Roberts. Tell us about that. Gary, who was one of the NHL’s top stars playing for the Calgary Flames as left wing for 10 years from 1985, and famous for his strength and fitness, was forced to retire after the 1995-96 season because of a serious neck injury that required two surgeries with limited success. He sat out a full season. Anxious to return if at all possible he tried everything, and saw Colorado chiropractor Dr Michael Leahy, founder of ART. He started getting great results and found he could return to strength training for his neck. As he was living in Toronto Mike Leahy referred him to me and I have worked with Gary ever since. 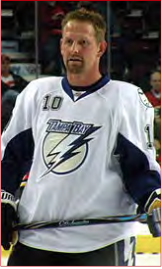 He was back in the NHL the next season and went on to play another 11 seasons, ending in 2009 with the Tampa Bay Lightning at the age of 43. 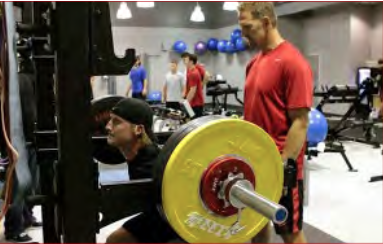 He now trains many NHL stars and others at his Gary Roberts High Performance Center in Toronto, where I continue to see him and many of the players. He is very open in the media and with everyone about his support for chiropractic and what it has done for him. Your work with Roberts and other NHLers led to you being staff chiropractor for the Toronto Maple Leafs for five years to 2008. What time commitment did that involve? There was attendance at one practice weekly for tune ups and injuries, pre-game tune ups for all home games, and travelling with the team on all road trips with more than two away games. I had similar commitments with the Toronto Blue Jays. This was such a pressure on my other practice and commitments that I took a partner, Dr Mike Prebeg, a New York Chiropractic College graduate who had developed the same clinical approach as me, and he helped with the Leafs and then the Toronto Blue Jays. What is your current week and practice like? My basic week is two days at my Niagara Falls clinic (Monday and Thursday) and three days in Toronto at Mike’s clinic during which I work with the Blue Jays during their season Wednesday and Friday afternoons. Mike does Mondays. Various travelling assignments interrupt this pattern and take up weekends also. Mike and I are partners and have trained many sports chiropractors in FIT. They work in 22 interdisciplinary clinics known as the Athletes Care Medical Centres in and around Toronto, providing the chiropractic component of care. Have you seen athletes and their coaches become more open to sports chiropractic over the past 20 years? Absolutely. This is part of the dramatic shift occurring in the whole field of sports medicine and the way injuries are pre- vented and managed. With small gains in performance being so important, so much money to be made and with careers so potentially fleeting, athletes are wanting to be proactive and be helped with as much expertise as possible. They are not waiting until they have an injury. They are very conscientious about their body, can feel it when things aren’t a hundred percent right and want to get things tuned up before they become problems. They and other members of the sports medicine team are much more open to the role of sports chiropractic. Twenty years ago relatively few elite athletes and pro teams has regular sports chiropractic care available. Today there are numerous chiropractors doing this challenging but very exciting work.